BUFFALO, N.Y. (AP) — Should Dion Dawkins require inspiration when Buffalo hosts the New England Patriots in a few weeks, the Bills offensive tackle can just look down. On Dawkins’ feet will be a pair of cleats designed by pediatric cancer patients at Buffalo’s John R. Oishei Children’s Hospital. Dawkins, center Eric Wood and linebacker Preston Brown visited the hospital Tuesday night to assist about 10 patients in designing customized cleats which the players will wear against their AFC East rival Patriots on Dec. 3. It’s part of the NFL’s “My Cause, My Cleats” campaign in which players are allowed to wear their own style of footwear reflecting their commitment to charitable causes. This exercise in design proved colorful. Each patient and player were handed a white sheet of paper that featured only the outline of a cleat. While Bills’ red and blue colors proved prominent, some chose yellow and orange. And the designs ranged from lightning bolts, happy faces and one featuring a line of stick-figure children holding hands. The submissions were then forwarded to artist Jake Marquart, who will replicate the best designs on leather for each of the three players to wear. “Bringing their thoughts to life,” said Marquart, who noted it takes him anywhere from two hours to two days to make a pair of customized cleats. “I’m sure for these kids, it will absolutely mean the world to them to see that on TV, players rocking the stuff they made,” he said. It sure would, said 19-year-old patient Anthony Karam, who referred to himself as a Bills fan from Day One. Wood was grateful for the chance to take part. “It’ll be fun for them to be able to turn on the TV and say, ‘Hey! I made those cleats,'” Wood said . Following the game, the cleats will be auctioned off with the proceeds going to the each player’s cause. 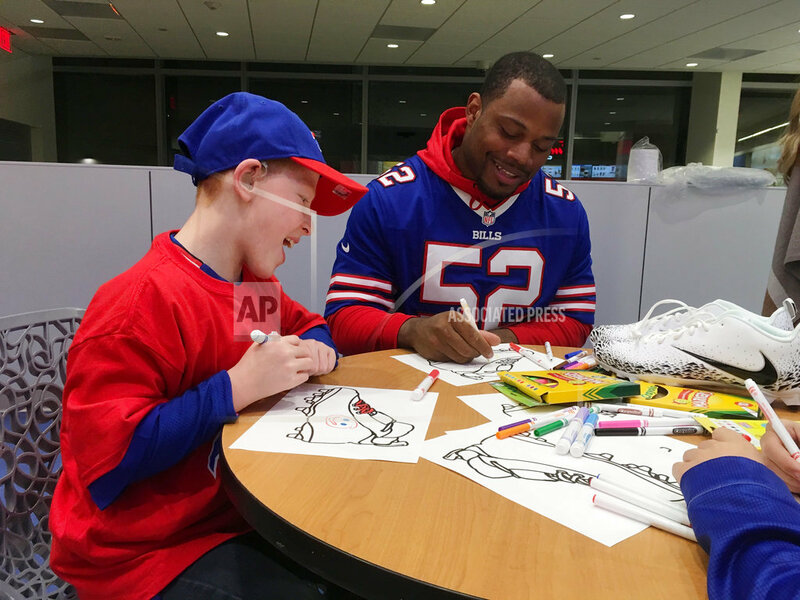 The Bills estimate about 25 players will take part in the “My Cause, My Cleats” campaign. On Monday, Wood’s charitable foundation, The Eric Wood Fund, held its Flights and Bites event, which raised $57,000 to support The Children’s Hospital of Buffalo Foundation and Stone’s Buddies, a program that assists chronically ill children.